While I was writing the article "Symbols of Royal Arch Masonry - Part 2", I started to wonder about the sigils (the symbol or seal) which adorned each of the four banners used in Royal Arch Masonry. I wondered as to why we used the Tribes we did on our Banners, but the answer to that was easy enough to find. I wasn't done though, I wondered as to what the significance of these four symbols was and what, if any, connection they had with ancient cultures and mythologies. But our American Royal Arch Masons, as we have seen, use only four banners, being those attributed by the Talmudists to the four principal Tribes Judah, Ephraim, Reuben, and Dan. The devices on these banners are respectively a lion, an ox, a man, and an eagle. We must, then, depend on the Talmudic writers solely for the disposition and arrangement of the colors and devices of these banners. From their works we learn that the color of the banner of Judah was white; that of Ephraim, scarlet; that of Reuben, purple; and that of Dan, blue; and that the devices of the same Tribes were respectively the lion, the ox, the man, and the eagle. It's likely that this last verse was influenced by Ezekiel's vision. Ezekiel and the use of the four faces in his vision may have been influenced by his environment as he wrote his work during the Jewish captivity in Babylon. 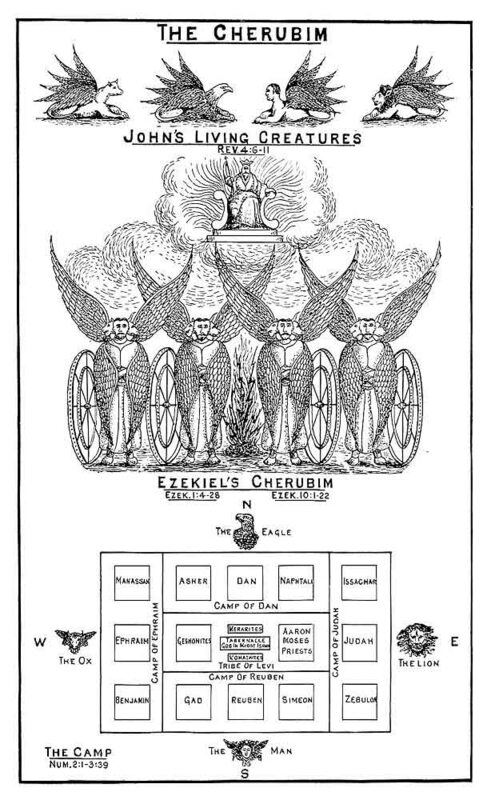 These Four Living Creatures seen in Ezekiel's vision are referred to as "tetramorphs" and are said to be the Four Cherub who surround God on His Throne and represent the Tetragrammaton (the four Hebrew letter theonym), and in the New Testament are said to represent the Four Evangelists who scribed the four aspects of Christ. The Four Living Creatures associated with Ezekiel's vision, then applied to the Four Evangelists and the four principle Tribes of Israel are also associated with the four fixed signs of the Zodiac where the Man represents Aquarius, the Lion represents Leo, the Ox or Bull represents Taurus, and the Eagle is associated with Scorpio. Tetramorphs are defined as "a symbolic arrangement of four differing elements, or the combination of four disparate elements in one unit. The term is derived from the Greek tetra, meaning four, and morph, shape." 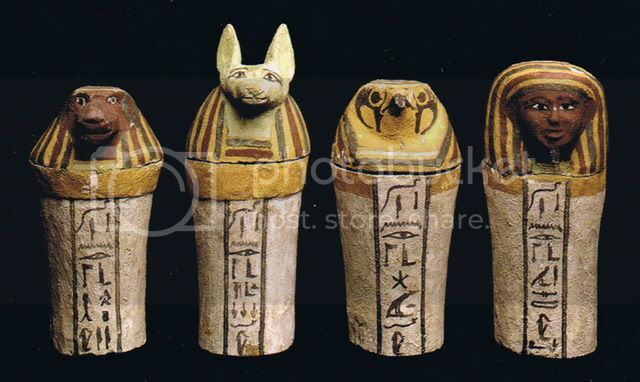 Tetramorphs appear in many ancient and modern cultures, and the most common theme that binds them all together is that they usually stand as guardians or protectors. Some cultures may use the same or similar animals and some use completely different animals, but the theme of guardianship remains the same. As I stated above, the Four Evangelists have been symbolically represented by the Four Living Creatures seen in Ezekiel and Revelations. In Christian art these tetramorphs often surround Christ and each Evangelist is represented by one of the Four Living Creatures. Matthew is represented as a Man as his Gospel revolves around the human life of Christ. 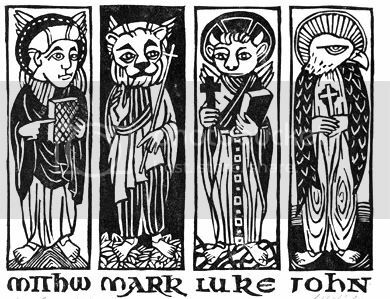 Mark is said to be represented as a Lion because his Gospel surrounds the royalty of Christ as the lion is the king of the beasts so too is Christ the King of Kings. The Bull or Ox, an ancient symbol of sacrifice, is said to represent Luke due to the fact that this Gospel shows us the atonement and great sacrifice of Jesus Christ. Finally, John is said to be represented by the Eagle as his Gospel deals with Christ and the Word of God as the Eagle was to the ancients a divine messenger and is the Master of the Skies. There are many examples of the use of tetramorphs in ancient cultures such as Egypt, Assyria, Sumer, Mesopotamia, Greek, and Babylon. The first example that came to mind is the "lamassu". The lamassu is a protective or guardian deity which was often depicted with a bull or lion's body, wings, and a human head. The lamassu could often be found near the entrances to households, palaces, temples, or cities. To protect houses and smaller dwellings, the lamassu was engraved upon tablets and then buried at the threshold of the door. For palaces, temples, and city entrances there could be found large statues of the lamassu, often in pairs, each standing as a sentinel on either side of the gate or doorway. For city entrances, location permitting, there would be four pairs of lamassu where each pair would face in a cardinal direction. We see the difference and that only two of the heads correspond to the Christian tetramorphs, that of the human and the eagle/falcon. It should be noted that Ezekiel saw in his vision that these creatures came forth from a cloud and the Four Sons of Horus would never have been associated with a cloud or storm due to the fact that Set, the nemesis of Horus, was the god of storms and chaos. There are also many examples of tetramorphs in various mythologies like the manticore or harpies. In closing, it's reasonable to assume that the sigils of these four Royal Arch banners were, depicted as they are, influenced by Ezekiel's vision of the four cherubim. Such use of tetramorphs is not unique to the Judeo-Christian traditions, but has been long seen in the ancient world. Tetramorphs are commonly used as divine guardians and we see this commonality with the Masters of the Veils and Royal Arch Captain who bear and protect the banners, and who represent the attendants who protected the four veils of the Tabernacle.